Maybe you’re walking the dog and need to send a text, or pushing a grocery cart while browsing your shopping list app. If you’ve tried operating a smartphone with one hand, you know it can be done, but it’s not the most secure feeling. FlyGrip is designed to make it safer and easier to use your smartphone, tablet or e-reader with one hand. Michael Karmatz created FlyGrip because he found it frustrating to use his phone with one hand. His invention, which is made in the U.S., is simple yet effective. It’s a small, hinged plastic grip that adheres securely to the back of your device. It’s ergonomically designed so you can comfortably hold a phone, tablet or e-reader with two fingers -- your middle and ring fingers -- and free up your thumb to navigate the device. FlyGrip is available in three sizes, and it comes with foam inserts so you can achieve just the right snugness. It also doubles as a phone stand. When you’re not using it, the grip folds nearly flat (to about ¼-inch thickness). With FlyGrip, you can worry less about dropping your phone and focus more on the task … or multitasking… at hand. Stick it on, and you’ll be ready to swipe, text, and scroll your way to smartphone dexterity. Greetings Daily Grommeters! I am so excited to speak with you about FlyGrip.You will be amazed how comfortable and secure it feels in your hand while making your smartphone experience so much more enjoyable. I’m looking forward to answering any questions you may have about FlyGrip. I like my current phone case - do I need to use one of the ones that comes with the FlyGrip or will it work with my existing case? 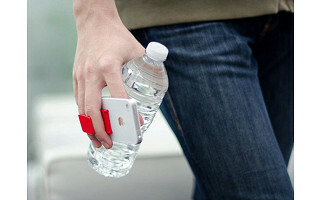 FlyGrip will work with any case as long as it is not silicone (the really rubbery cases) or if it has too many grooves. FlyGrip sticks best to smooth surfaces. If you aren't sure about FlyGrip sticking on your case, you can send an image to the Daily Grommet team at [email protected] and they will guide you from there or put you in touch with me. Hope this helps! Got it - my case is silicone, but then with a hard plastic armor shell over that, so I should be OK. Thanks! Why don't they have a case for Blackberry? We are currently offering the most popular cases. Offering Blackberry cases can get a little tricky, since there are so many models. FlyGrip should work on your existing case or will stick directly to your phone. I have mine on the back of my Blackberry Torch and it works great! Do these 'play nice' with Otterbox Defender cases? Videos ARE helpful! Just spotted the Otterbox in the demo video! For use with the Otterbox Defender case, we supply a free primer with your purchase. Make sure to add a note when placing your order and we'll make sure you get it! The developers comment mention using it with a tablet. Will it work with my ipad 3? Do I need a case? Is one available with this,product? FlyGrip is compatible with tablets, however for the kickstand feature we recommend using 2 FlyGrips (one on either end). FlyGrip will stick directly to your tablet, and the only free cases we are offering are the iPhone 4 & 5, and Galaxy S3 & Note. Can you re-apply the FlyGrip if you change cases? I have an Otterbox Commuter, but like to change colors at least once a year. Absolutely! FlyGrip comes with two adhesives - one already applied and an extra one in the box. Each adhesive is for a single use, but the FlyGrip itself is not a single use item. It can be moved from case to case or phone to phone. For replacement adhesive packs, contact [email protected] and they will guide you from there or put you in touch with me. Abbie- These look fabulous and I want to order them for my whole family but how do I determine which "size" is best? The details tab actually has a neat little test that will work for this. You can find it on the tab labeled "details" directly to the right of the tab labeled "story". It's a pretty easy, yet detailed test that should work. Let us know if you are able to find it. This looks like a great product. It also look like it's well made. I have a Galaxy Note 2 and I don't know if this gadget will work. In any case, I'm still trying to figure if I should hire your gadget to do the specific job. Also, price point is a little high. $20 sounds good to me. Hope it will get to that price at some point. Thank you for the support Patrick! I appreciate your feedback and while the price may seem a high, there are many reasons for this. FlyGrip is a made in America product, and we also give back to charity, including Bethany Hamilton's foundation. This $30 gadget could save you from a $100+ screen repair from being dropped just one time. FlyGrip can also definitely help hold the Galaxy Note 2 with one hand. 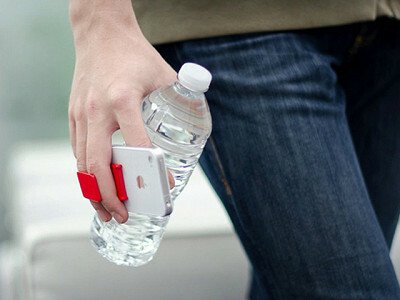 That phone is so large, and almost impossible to hold without FlyGrip! Looks like a great little grommet! Two questions, will this adhere to a plastic case, and...will it adhere to a cover with slightly raised rubber grippy lines on the plastic cover? FlyGrip will adhere to plastic, but I can't be too sure about your other case without seeing an image. If you can, send an image to the Daily Grommet team at C[email protected] and they will guide you from there or put you in touch with me. Hope this helps! Hi This looks like a great product. I applaud you for being American made. Let us know if you have any other questions. I'm happy to help! Is the carbon fiber flygrip actually made from carbon fiber? You can always find this information out by clicking on the "details" tab right next to the "story" tab. The fly grip is made of : Made of polycarbonate, nylon, stainless steel pins and springs. Is the iPhone4 case compatible with a 4th Generation Ipod Touch? This is an interesting question and one that others might have. I did a little research and it looks like they won't indeed fit interchangeably. They're different shapes. Maybe you’re walking the dog and need to send a text, or pushing a grocery cart while browsing your shopping list app. If you’ve tried operating a smartphone with one hand, you know it can be done, but it’s not the most secure feeling. FlyGrip is designed to make it safer and easier to use your smartphone, tablet or e-reader with one hand. 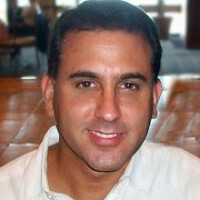 Michael Karmatz created FlyGrip because he found it frustrating to use his phone with one hand. His invention, which is made in the U.S., is simple yet effective. It’s a small, hinged plastic grip that adheres securely to the back of your device. It’s ergonomically designed so you can comfortably hold a phone, tablet or e-reader with two fingers -- your middle and ring fingers -- and free up your thumb to navigate the device. FlyGrip is available in three sizes, and it comes with foam inserts so you can achieve just the right snugness. It also doubles as a phone stand. When you’re not using it, the grip folds nearly flat (to about ¼-inch thickness). FlyGrip will adhere to plastic, but I can't be too sure about your other case without seeing an image. If you can, send an image to the Daily Grommet team at [email protected] and they will guide you from there or put you in touch with me. Hope this helps!